Conservatives in twenty-first century America often fear an assortment of boogeymen that may or may not actually exist. Whether it is the specter of “cultural marxism,” the ever-dangerous “postmodernism,” or the perceived rise of “incivility” in public life, conservatives can generally feel that something wicked this way comes. Labels like “cultural marxism” often indicate a problem that cultural critic Alan Jacobs describes as exhausted language becoming axiomatic: “conversations cease to be conversations but rather turn into endlessly iterated restatements of quasi-religious conviction.” Jacobs argues that “when people are just trotting out the same limited set of terms in every context, that says something about the inadequacy of the vocabulary itself.” Nevertheless, there is something to be said for the intuition that something has gone dangerously awry in American life and further, that certain expressions of both Far-Left and Far-Right politics are deeply corrosive. 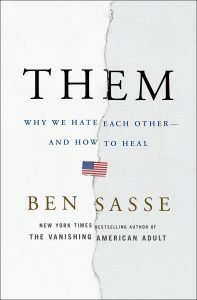 Senator Ben Sasse’s latest book, Them: Why We Hate Each Other—And How To Heal, taps into those intuitions, examines them critically, and then offers a refreshingly clear view of what ails our civic society, even as it fails to provide a robust vision for to how to restore that society. Sasse identifies three interconnected challenges that we need to face with courage and prudence. The first challenge is rootlessness, which manifests itself in loneliness and a corresponding disregard for our Heideggerian “beingness” in particular place and time. The second challenge is the inflation of the virtual self, which manifests as an unhealthy connection to the online world at the expense of real-world community. The third challenge is a conflation of politics and civic life, which manifests as an infatuation with governmental power to the neglect of all other forms of community involvement. It is worth unpacking each of these challenges in turn. Sasse observes that “as jobs last a shorter time, and become less connected to tangible communities, we can hardly be surprised that people are feeling more detached and rootless.” Sasse cites the usual suspects—Putnam, Murray, and the like—to explain why community is so fragmented. The talking points are by now familiar to us, though no less true for that familiarity: the invention of the car, the proliferation of cable news sources, the rise of a globally connected financial market. The more novel aspect of Sasse’s analysis is how he connects this problem of rootlessness to the experience of alienation in the “emerging adult” demographic. He writes, perfectly capturing my experience and that of my peers, that “many of our young adults feel a hard-to-define, existential ache in their chests: What is my calling? Where is my place? Who are my people?” And he explains the origins of that ache: “we’ve generally set our young people ‘free’ to find meaning on their own—apart from any communities into which they might have been initiated and which could have offered guidance.” This is a stirring critique, not of “young people these days” but of elders: it isn’t so much that the young pulled away from institutions and communities, but that they were pushed away in order to “find themselves” (at college, abroad, in the military) or, even worse, never properly integrated within those communities and institutions in the first place (Young Life and Life Teen aren’t exactly the most effective ways to catechize the youth). Sasse doesn’t let “young people” off the hook though. Too often we let the perfect be the enemy of the good and avoid investing in the communities available to us. “Bloom where you’re planted” may be cliché, but it’s still true. Another area in which we are culpable for our own maladies is in our addiction to social media. Sasse writes forcefully, noting that “we undermine these roots [in real, communal, messy life] every day by scrolling through feeds, trying to throw ourselves into a different time and place, because maybe things are better there.” We should know better: it’s no longer shocking to hear that after losing ourselves in endless feeds, “the end result is aching loneliness.” Given our addictions, it is worth exploring the dangers that the virtual self poses in more detail. As a transition into the final challenge, note that the virtual self formed through national media is a self that conforms to mass culture, and this leads to a stunning loss of diversity. Sasse writes that “D.C. is not supposed to merely tolerate but to actively encourage a wide diversity of local communities.” And this means that “we don’t need to agree on everything: we simply need to allow the space for communities of different beliefs and custom to flourish.” But if we don’t cultivate a sense of distinctive identity tied to locality, we will conflate political and civic identity in ways that lead us to despise our own localities precisely because they do not conform with the one-size-fits-all politic we imagine will be best suited to human flourishing. How do we cultivate the civic life and ensure that it is never subsumed into the political? Naturally, Sasse’s answer is to dig deeper into our own localities. He writes: “when we look around our neighborhoods, we should have eyes to see that we share common interests and goals that are more important than just about any question of federal policy—chief among those goals, raising our children to become kind, thoughtful, gritty, respectful adults who use their skills and talents to serve others.” And with that insight, it all comes full circle: parents building communities in which their youth can flourish leads to emerging adults who have learned how to value and invest in communities of their own. Sasse’s book is a helpful snapshot of the present moment, but it lacks a robust vision for systemic change. This, too, is fitting for the conservative: at least since Nisbet’s groundbreaking book The Quest for Community (the more profound precursor to Bowling Alone), conservatives have been much more adept at pointing out cultural problems than in figuring out how to fix them. Aside from the rather practical and vital advice on blooming in one’s garden, Sasse gestures briefly in the direction of ideas like “the sharing economy,” “Tiny Houses,” and “New Urbanism” as possible solutions to the systemic and systematic loss of community in our nation. These ideas are good so far as they go, but how far is that? There have always been outliers in the conservative intelligentsia who have dared to question fundamental axioms of American life. The Agrarian tradition (whether Kirk or our contemporary Berry) asked us if urbanization is always good. Bozell and various other illiberals asked if procedural liberalism is as value-neutral and merely instrumental as has been suggested. And of course the merits of “free market” “capitalism” (in quotes because, again, is this exhausted language?) has always been fiercely debated both within conservatism and outside of it. Sasse’s book can hardly be faulted for not producing answers to all of these questions, but these are the questions his book brings to mind. Nevertheless, if this book teaches us anything, it’s this: we desperately need for those questions to be fiercely and lovingly debated in public places in our local communities.